An up-and-coming magician helped to raise thousands of pounds for charity while playing in a match against some of his football heroes. Ben Taylor, 24, who performs as the Magic Mod, wore the number 14 shirt when he took part in the match to raise money for the children’s hospice, Shooting Stars Chase. Ben, of Tilgate, entertained the players with some of his magic skills before taking to the field to show off his ball skills. Having supported Fulham since he was a child, Ben said it was a “no brainer” to take part in the match when he was asked. Describing how it felt to take to the pitch at Craven Cottage in front of thousands of supporters, Ben said: “We walked out of the changing room to warm up and there weren’t many there. “But when we came out for the game, there were seven or eight thousands and I had tears in my eyes to walk out with my heroes. To add to the excitement, Ben even got the chance to take a penalty, only to see it saved by goalkeeper Sam Beasant. HIs failure to find the back of the net didn’t bother Ben too much. He said: “I took a short run-up and he saved it from the top corner. 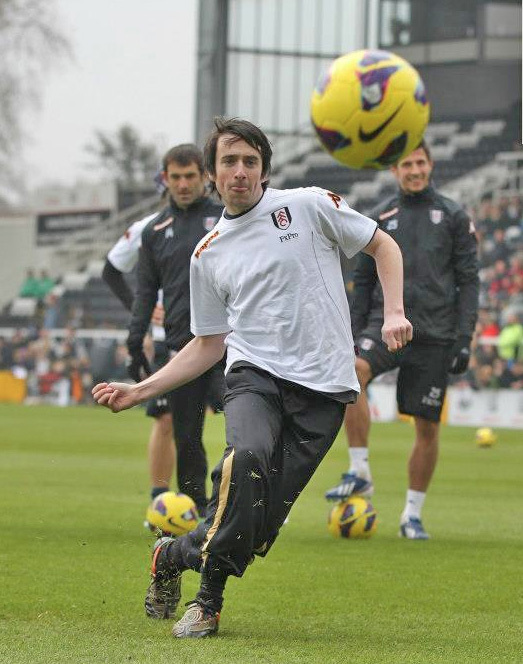 Ben, a former Crawley’s Got Talent contestant, has become a familiar face at Fulham’s training ground, giving demonstrations of his magic tricks. He said: “I can’t thank Fulham enough. They do so much for me. Shooting Stars Chase supports the families of children and younger people with cancer – from babies up to the age of 21. The support starts from the moment of diagnosis and stays with the family to the end of the child’s life and throughout the bereavement process. Explaining whey he was keen to support the charity Ben said: “I didn’t realise how much they did do. For more information about Shooting Stars Chase, log on to www.shootingstarchase.org.uk, email hello@shootingstarchase.org.uk or call 01932 823100.